Thanks for your interest in my work. I hope the resources I've assembled here will make your job easier. Please feel free to write to Charles at this domain if there is anything else you need ... such as a review copy or a prize copy for your website promotion. A press release in HTML and MS Word formats. An extended description and table of contents in HTML. A brief abstract in HTML, suitable for catalogs and promotions. A short blurb in plain text, suitable for a list of brief descriptions of books. An interview about the book, conducted by Tim Anderson for Amazon.co.uk. The following cover images are available. A medium JPG (85K) of the front cover (shown above). A large PDF (670K) showing the front and back covers. All the cover text is legible. Your art department can edit this with Acrobat and save it in various formats. 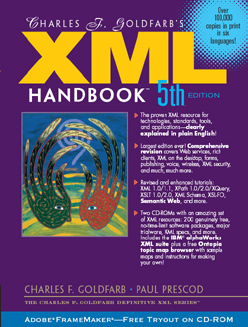 XML stands for "Extensible Markup Language". It is the latest in a series of markup languages that have had a pervasive influence but are little known to the general public. Ed Mosher, Ray Lorie, and I invented the first structured markup language in 1969, IBM's "Generalized Markup Language" (GML). In 1970 I coined the phrase "markup language" in order to describe our invention. GML led to SGML, which I invented in 1974. SGML literally makes the infrastructure of modern society possible. Our incredibly complex systems and products require massive amounts of documentation—4 million pages for a single model of aircraft, for example, which must be updated quarterly. That documentation couldn't be created and managed without SGML. The same is true for the documentation of nuclear plants, oil rigs, government laws and regulations, military systems—and anything else that is too complex for a single person to understand and that has life-and-death significance. All of those things are documented with SGML. The World Wide Web is also powered by SGML, in the form of HTML and—more recently—XML. In 1999 the Society for Technical Communication recognized that synergy by conferring Honorary Fellowships on both the Web's inventor, Tim Berners-Lee, and myself. It was the only dual award since 1974, when Buckminster Fuller and Frank Winship received the first two Honorary Fellowships. HTML is a single SGML application—a page description language—while XML is a Web-optimized subset of SGML that can be used for lots of applications. For a quick and clear explanation of XML, read XML in an Instant: A Non-geeky Introduction. Other background resources, including photos and bios, are available in my personal press kit. To Charles F. Goldfarb's All the XML Books in Print. Copyright ©2004 Charles F. Goldfarb. All rights reserved. Information on this site cannot be used or cited for any commercial purpose, although links to the site are welcome. Any questions, comments, or suggestions? Write to Charles at this domain.